If you were to ask me 10 or 20 years ago about Umpqua, I would either tell you it is a great Steelhead river on the west coast or one of three major players in the world distribution of hand tied flies with the likes of Jack Dennis, Andy Puyans and Dave Whitlock as a golden team of fly tyers. For those who aren’t connected to the world via social media, they might not think otherwise today. Little would they know UMPQUA FEATHER MERCHANTS has recently taken a bold and revitalized approach to their merchandise line of fly fishing accessories and apparel. Often, this can be a difficult task, the fly community can be resistant to change. I, being one of the guys who still appreciates having a vest with a minimum of 22 pockets for leader, sinkers, thing-a-ma-bob’s, tippet, fly boxes, dessicant, maps, hatch charts, tape measure and emergency Ziploc pack (matches and TP); to the new minimalist Waist or Chest Pack that allows for the adventurous angler to go further, wade deeper, climb easier and in more comfort than they ever have before. This past summer, I had the opportunity to meet and chat with one of our region’s most notable representatives for Umpqua and got the chance to actually touch and feel an assortment of functional and sleek new boat bag, chest pack, backpack and waist packs from UFM. The colors are hot, but not in the Hunter Blaze Orange ‘see you-coming-from-a-mile away’ manner, but soothing hues of blue and slate grey/charcoal with a hint of olive. Number one priority in my book and many others is the price versus value or longevity. I will pay top dollar for guide gear when I know it will outlast me, or my seasons on the river. 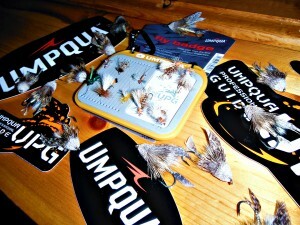 I think Umpqua nailed it on a variety of these packs and bags. Sensible waist packs, non-skid feet and reversible lid/workstation for the Famous Boat Bag, weather-proof zippers, hideaway pockets for shoulder straps on the Deadline 3500 wet/dry duffel and Surveyor 1100 Backpack, water bottle holder, hidden pockets for tippet and leader, magnets for resting overworked Stimulators- just to name a few of the innovative stand-outs on the Ledges 500 & 650 and Overlook 500 waist/chest packs. I hope to do a more in-depth review of many of these bags as they become available to the public next month. 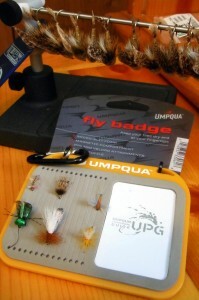 I have the new UMPQUA Badge in my possession and can hardly wait for better weather to head out and put it to the test. Initial impression is very positive. I even had an A-HA, ‘Why didn’t I think of that? ‘ moment when I inspected it closely. The entire idea is to replace or substitute my often failing wool patch on the conventional fishing vest where, more often than not, I place tired Copper Johns to rest, or allow exhausted pearl elk-hair caddis a brief respite from active duty. My elders never gave me the forewarning that this patch was indeed the gateway to the other world, much like the closet in the attic in ‘The Lion, The Witch and The Wardrobe.” More flies have been donated to the land of Narnia due to my untutored practices and surely forming an alliance of their own to fight against the White Witch. The Badge is multi-faceted. Part magnet, part foam slotted strip, part Velcro and part carabiner for a variety of function. The magnetic pad is tiny, but the entire badge is 3”x4”, and its primary purpose is for holding those dainty #18 RS2’s or WD40’s- I wouldn’t trust a #12 conehead muddler lest it join the leagues of previously lost flies preparing for battle with King Peter the Magnificent. Fourteen slotted strips allow for plenty of breathing space for a multitude of beadhead Hare’s Ears or parachute Adams. The back of the Badge has options for mounting on your boat or dashboard of the fishcar with the Velcro adhesive. There are also two separate pin attachments much like the nametag on your favorite wait-tron in red pinstripes at TGIFridays. Versatile in form and function, the Badge is finished with a small 1.5” Cara-biner for quick attach and release from any variety of D-rings you may have on your vest or chest pack. Overall, I think it is a great little accessory and would make an excellent gift for the angler who already has everything or for the beginner who wants something cool and innovative. Until I can get out and cast a few dry flies and drift a few soft hackles, the fly assortment on my Badge are safe from the chilly waters of the White Witch. Umpqua Feather Merchants LLC produces and distributes hand-tied flies for fly fishing customers and anglers. It offers steelhead dries and wets, wooly buggers and wooly worms, terrestrials, tarpon flies, streamers, and egg flies. The company also provides fly-tying hackles, hooks, and tools; leader and tippet products, tippet spools, materials, and accessories; and fishing tools and gadgets. In addition, it offers T-shirts, polos, sweatshirts, hats, and coffee mugs. 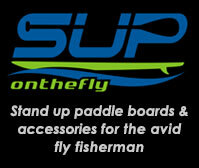 The company offers its products through fly shops, pro shops, wholesale distributors, and online retailers. Umpqua Feather Merchants LLC was founded in 1972 and is based in Louisville, Colorado.